and a yearning to return." 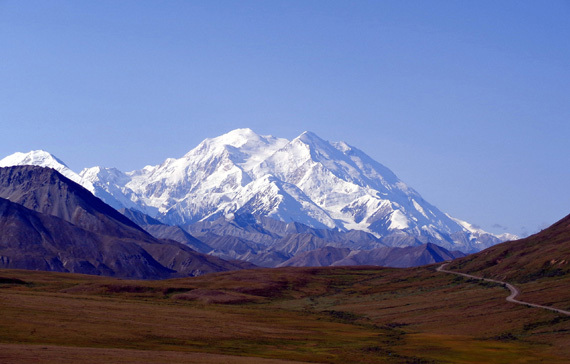 Yep, we'll be back again to this area for further exploration. 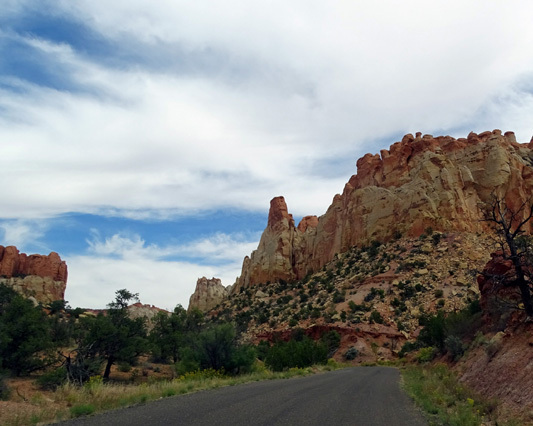 In the last entry I described the Grand Staircase-Escalante National Monument (GSENM) and showed photos from the first part of a day drive we did a couple weeks ago along National Scenic Byway 12 through rugged canyon country in south central Utah. 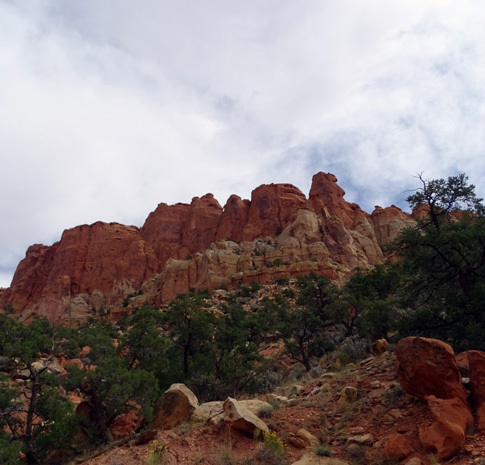 On a pretty Saturday in late September we drove outbound on UT 12 about 80 miles east in our minivan from our RV park in Red Canyon to the town of Boulder, UT, then another 19 miles on the Burr Trail before turning around. 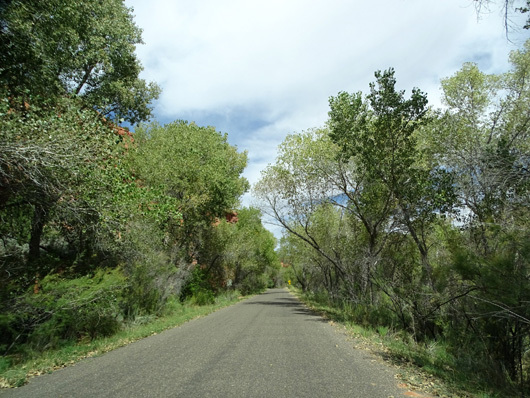 All of it was paved and in good condition. 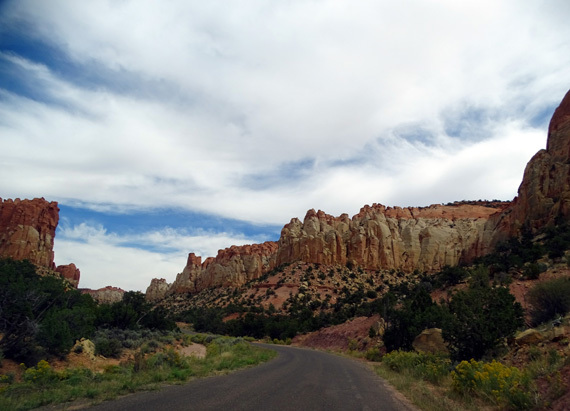 We could have gone another 11 or 12 miles on the Burr "Trail" before it became a dirt road at the boundary of Capitol Reef National Park but we had sensory overload by then. 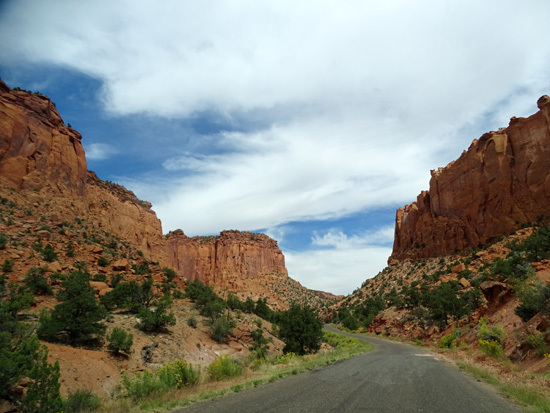 This is a super-scenic drive!! 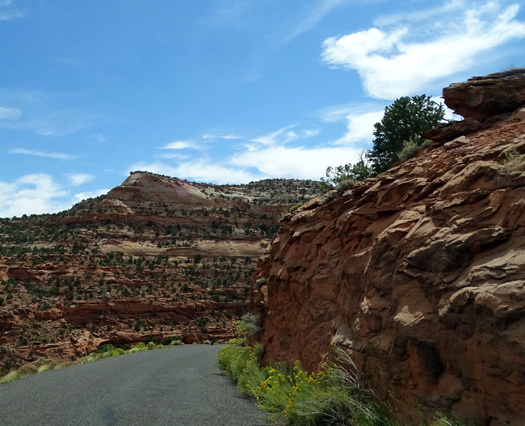 Even though the Burr Trail section comprised less than 20% of the distance we drove out and back, more than half of the almost 400 photos I took that day -- most as Jim was driving, or we'd still be out there -- are from the Burr Trail. 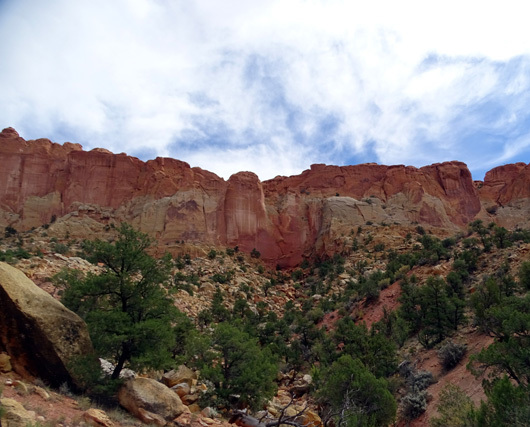 That should tell you something about how spectacular the Burr Trail is. 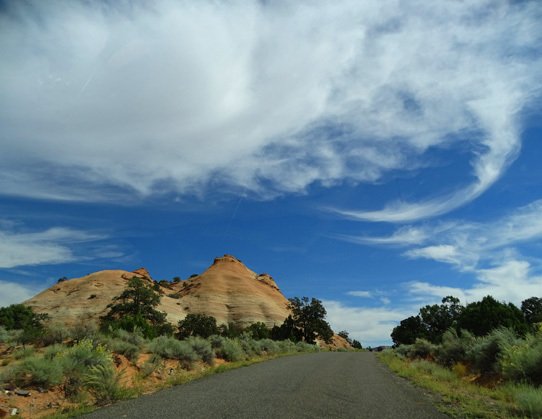 We are grateful to some other RVers in our campground for telling us about this road. 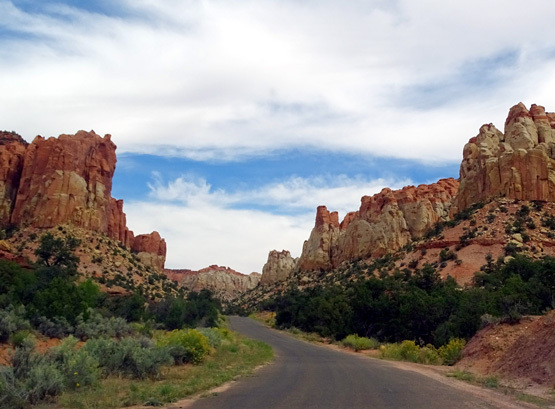 All the photos in this entry are from the Burr Trail, one of several more primitive roads through the monument that are designated as Scenic Backways. The others are all dirt, sand, and/or gravel. 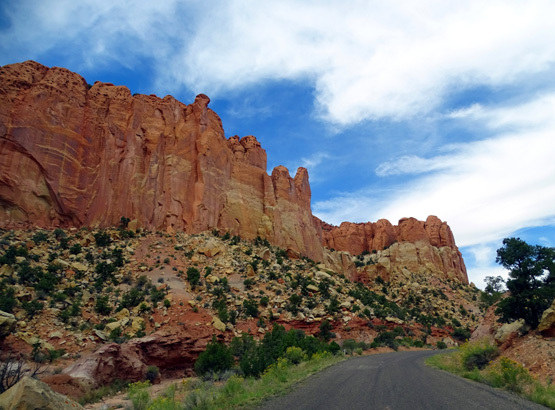 The west end of the Burr Trail is paved for about 30 miles from the little town of Boulder to the boundary of Capitol Reef National Park. 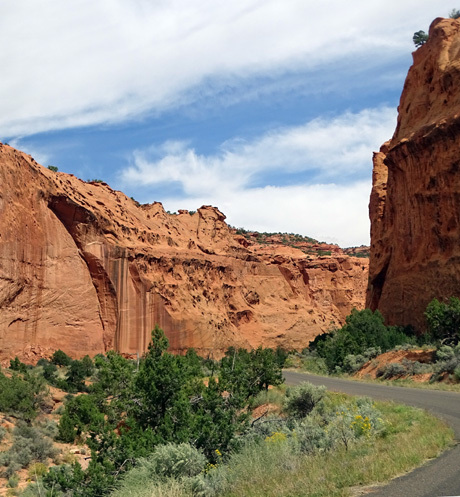 The 19 miles of this we drove are fine for a passenger vehicle or very small RV but we wouldn't want to drive our 36-foot 5th-wheel coach on this narrow, winding road. 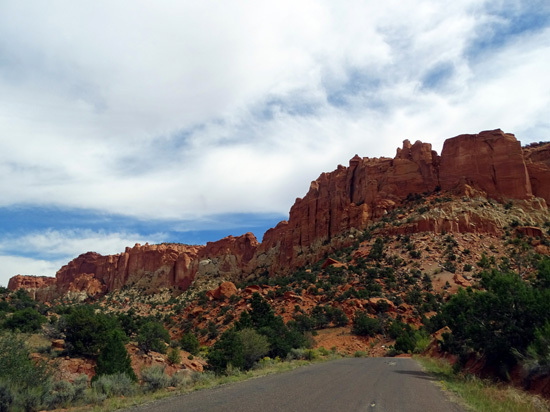 A sign near the beginning of the Burr Trail warns about steep grades and sharp curves and says the road isn't suitable for trailers. It's not suitable for larger motorhomes, either. 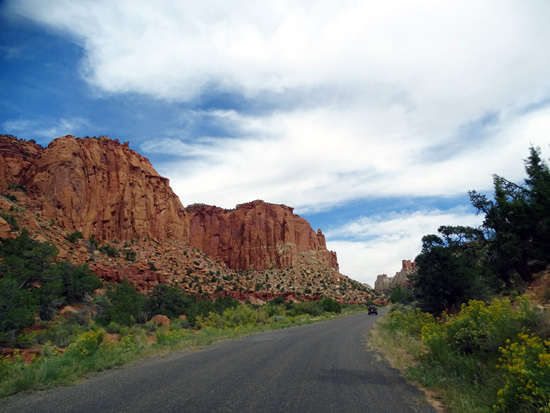 The Burr Trail is graded dirt and gravel the remaining 40 miles through Capitol Reef National Park and Glen Canyon National Recreation Area. It ends at the Bullfrog Marina at the north end of Lake Powell and UT 276. 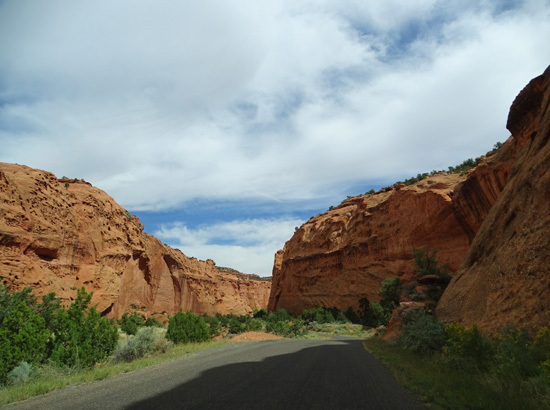 The unpaved part of the road is OK for high-clearance passenger vehicles if it is dry but even 4WD vehicles may find it impassible after it rains because of slick clay, washouts, and mud and rock slides. 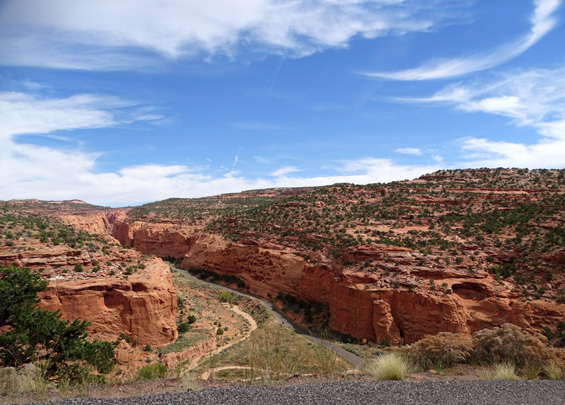 I've also seen pictures online of a section with tight switchbacks where the road descends about 800 feet in a mile; that section doesn't look suitable for anything over 20 feet long even if the road was completely dry. 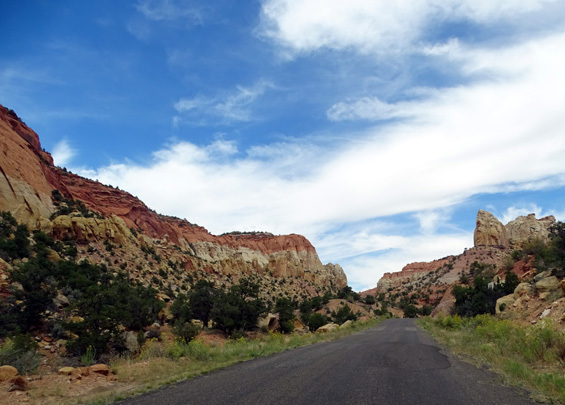 Here are more pictures from the 19 miles we traveled on this awesome road. 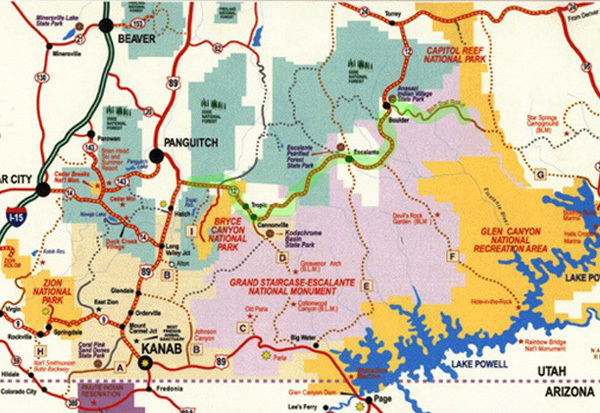 They are roughly in order beginning at Boulder, UT and show views going both eastbound and westbound. 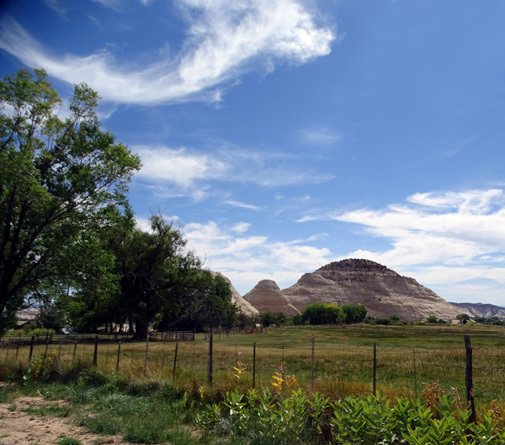 I don't know the mileage or name of every location, although this webpage from the National Park Service helps. 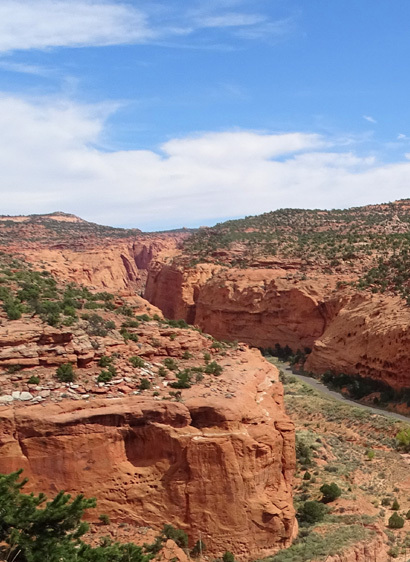 This VisitUtah.com webpage also has more information about the trail. 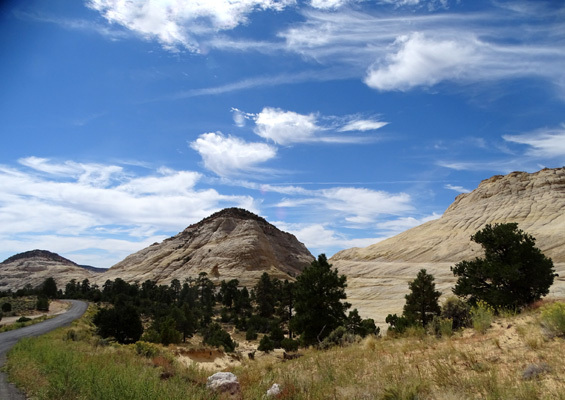 The rocks look like petrified sand dunes, and that description isn't too far-fetched. 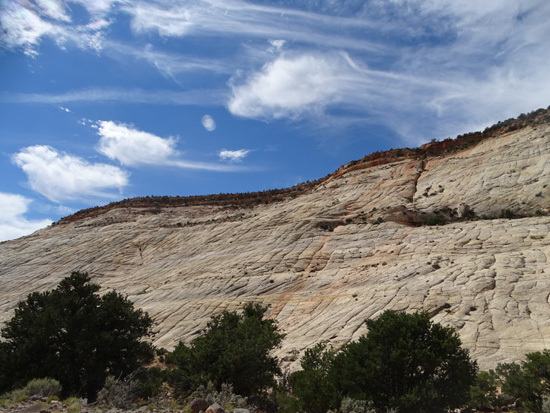 Millions of years ago, real sand dunes were covered by more and more sand and compressed into stone. 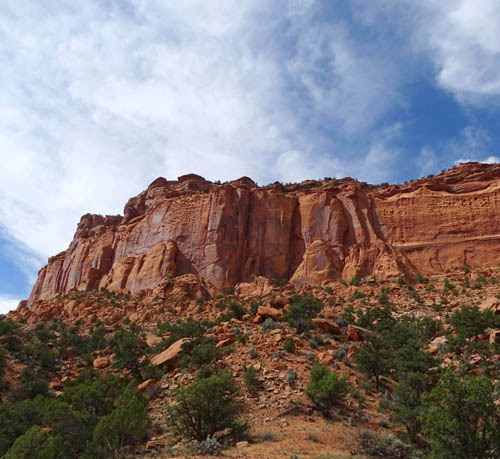 Gradually, over the millennia the overlying sandstone eroded away. 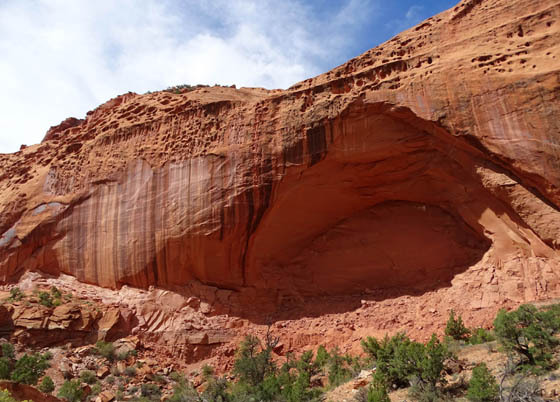 Today the light-colored Navajo sandstone, rounded into hills and domes, resembles the original sand dunes. 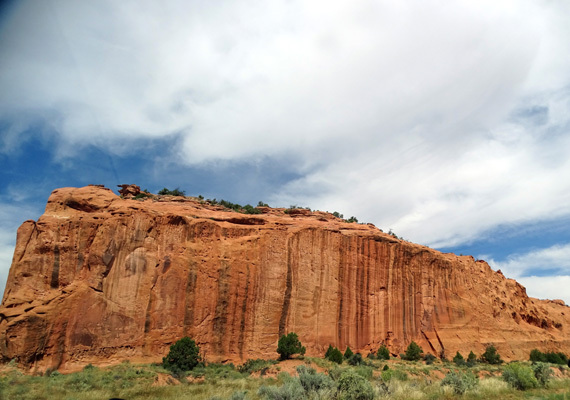 I was fascinated by the vertical and horizontal ridges on the slickrock because I haven't seen that feature so prominently before. 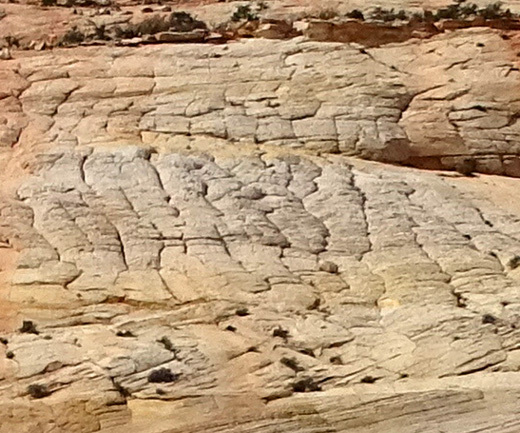 I assumed the grooves were caused by water or ancient glaciers. 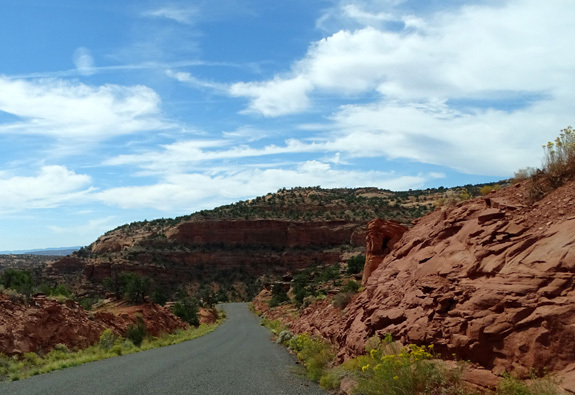 The Burr Trail just gets better and better the farther in you drive. 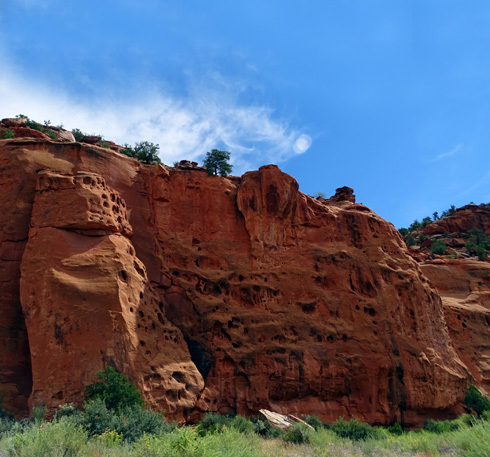 The next photos show the approach to the section of towering rock walls and fascinating colors in The Gulch and Long Canyon, sister gorges that stretch for about ten miles. 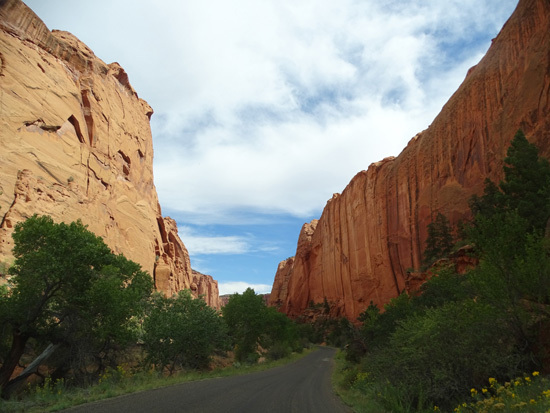 Look hard in the photo above and you can see that the walls get closer as you get farther into the canyon. Let's go down there . . . This riparian oasis obviously gets more water than most areas in GSENM. 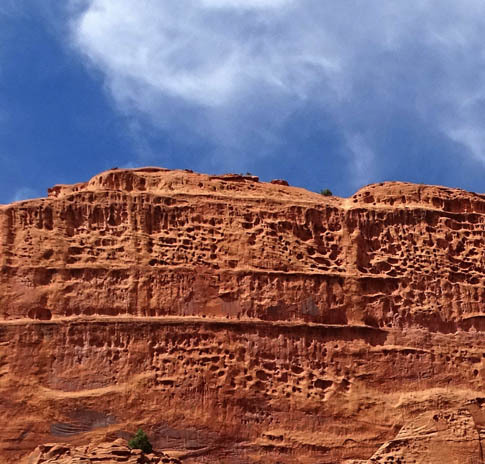 Many of the rock walls have interesting pockmarks and holes. 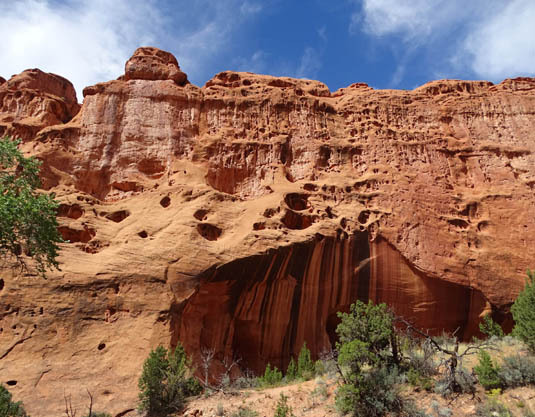 The canyons have sheer walls of Wingate sandstone that rise several hundred feet above the road. 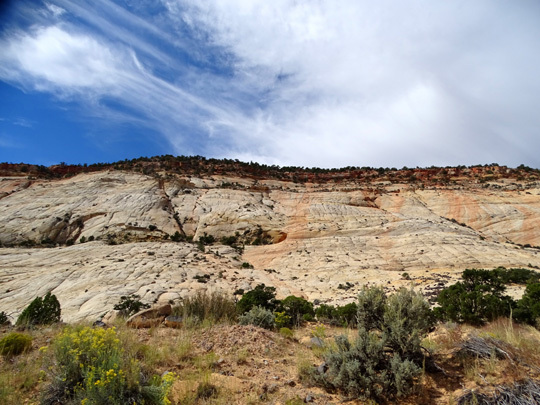 Above and below: There are lots of unique "stripes" on these walls and alcoves. A good example of "desert varnish"
The lacy erosion on this wall reminds me of the "boxwork"
patterns in Wind Cave in the Black Hills of South Dakota. 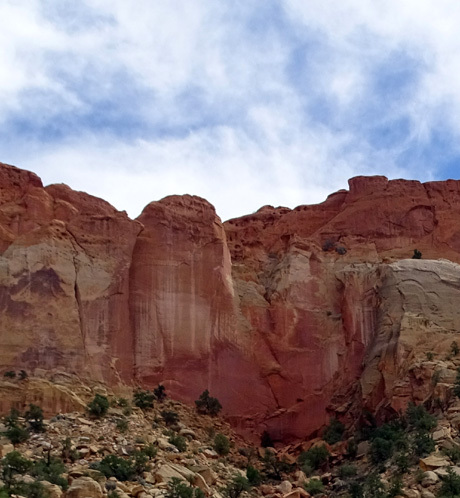 More awesome rock colors and formations on the next page . . .